Compare Car Hire at Santa Maria Airport - Get cheaper holiday auto rental prices for SUV, MPV, Minivan & convertibles. Good, cheaper car hire for Santa Maria Airport in the Azores. Book early through us and get the best choice and at a cost that is lower than going direct. Ilha Verde Car Rental & Avis - Both the reputable local company and Avis will have the pleasure of providing you with their usual quality vehicle and service. They both keep their fleets at the airport, so your journey will get off to a quick and smooth start. Young Driver - With Avis prices are shown for those aged 25 or more, whereas Ilha Verde are for those aged 23 and over. If under these ages, then check terms of each company for local surcharges and age restrictions. Included - Airport fees, road taxes, insurance, breakdown cover, unlimited mileage and excess reduction. Additional excess waiver can be purchased locally to reduce to zero. Santa Maria Airport also goes by the name of Vila do Porto Airport. It was originally built to aid the US Army during the Second World War. The airport is a short distance from the main town of Vila do Porto. The main tourist office is located in the arrivals hall and thestaff will be happy to provide help and information on places to stay and things to do. 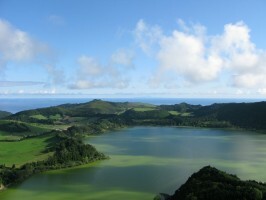 The island of Santa Maria has a beauty enhanced by being not as busy as the other Azores islands. However, definitely worth a trip for the beach and sea life, where there is no need to get your towels down early! Plenty for the more water sporty to do and those who like hill walking. Compare vehicle discount for Santa Maria Airport. Book early for convertibles on the Azores Islands. Find deals on SUVs on Santa Maria in the Azores. You are just one more click away to find out about all the Santa Maria goings on. Watch out for some great hand crafted items, in particular bed sheets and pottery. Fleets are renewed each year with models to suit every need economy, sport, de luxe, prestige and four wheel drive. No charge for amendments. Full insurance, airport fees and unlimited mileage are just some of the reasons why you should book with us, not to mention our prices are lower than going direct. This makes car hire at Santa Maria Airport ideal for any family on a fixed budget. Hotels can now also be booked with Agoda, through our link on this page. Can we assist with the other Azores islands? Or and need car hire on Portugal or Madeira? We can help.